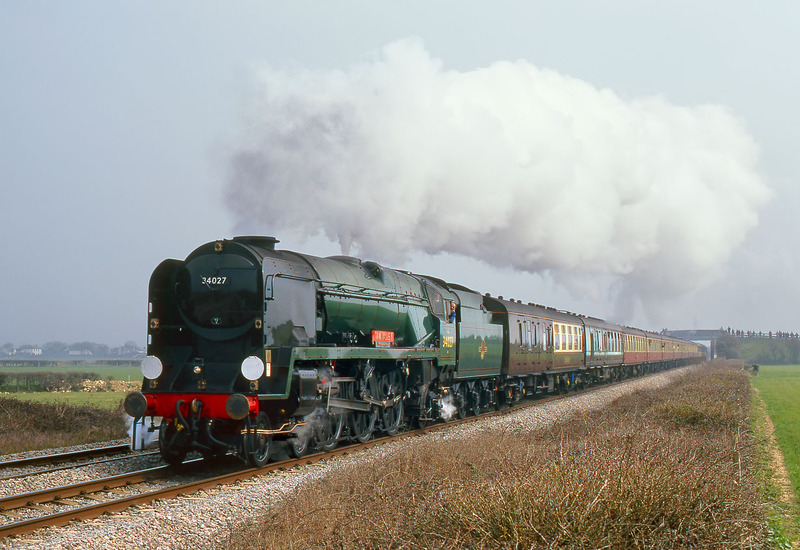 On a very misty 6 April 1996, West Country Class 4-6-2 34027 Taw Valley passes St Athan with the Pathfinder Tours 1Z63 06:28 Crewe to Swansea 'Tawe Taw Tourer' (easier to type than to say!) railtour, which the steam loco had taken over at Bristol Temple Meads. Initially I was with all the other photographers on the bridge in the background, but I decided to venture down the field to a footpath crossing so as to be at a lower level and hopefully not get the exhaust covering the train. A good plan, as the picture taken by those on the bridge was nothing like as good!